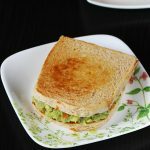 Guacamole sandwich recipe – one of the easiest breakfast recipes using bread and ripe avocado. 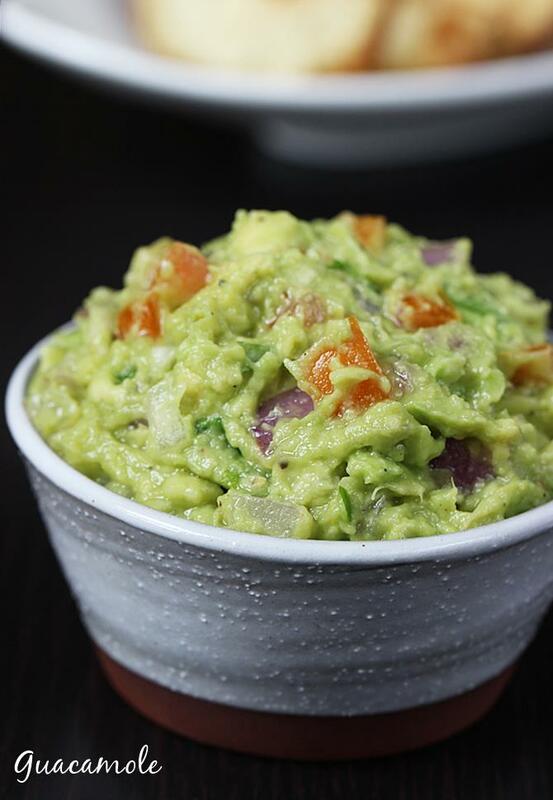 Guacamole is a dip made using ripe avocado, chopped onions, tomatoes and seasonings. It can be served with potato wedges, chips, pita bread, tortillas, burger or even to make a sandwich. 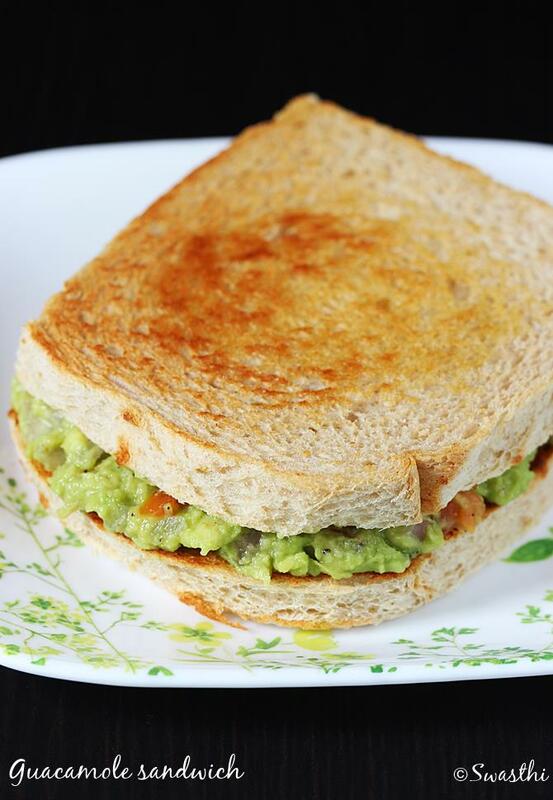 This guacamole sandwich needs just 15 minutes, a quick breakfast recipe for a busy week day. It can also be had as a evening snack. 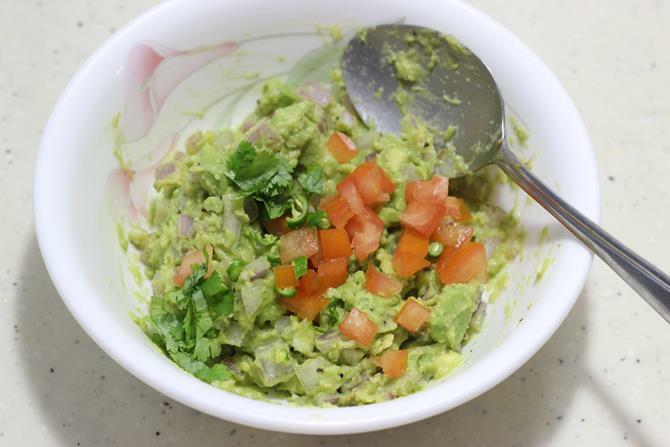 I am sharing the basic guacamole recipe which goes great as a dip, or with a veg burger or simple sandwich. To make guacamole, we need ripe avocados. To ripen them i wrap them in a paper and set aside for 2 to 3 days. 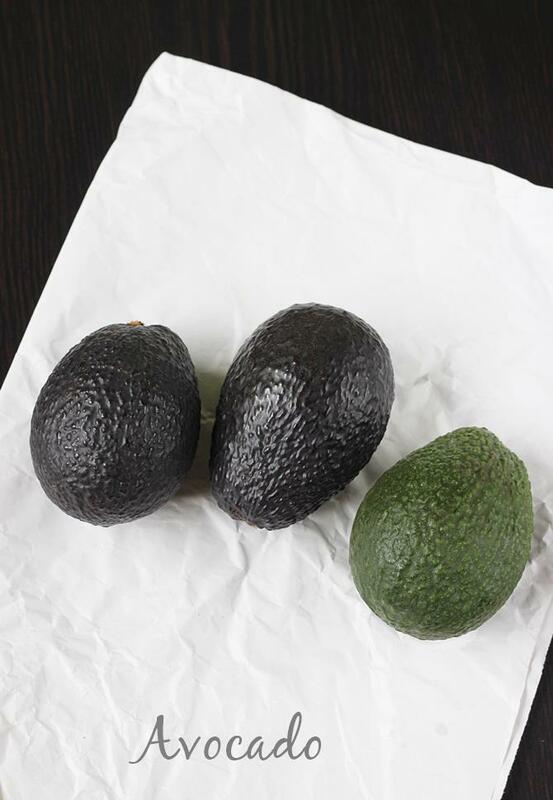 The color of the avocado turns from green to dark brown green when done. 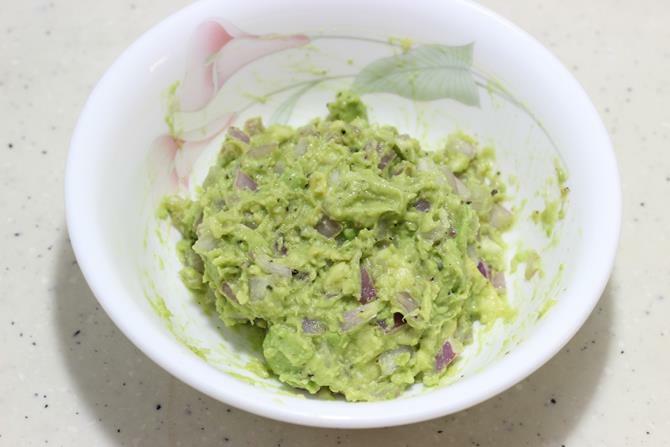 The ripe avocado is mashed and then mixed with seasonings, lemon juice, onions and tomatoes to get a buttery tasting dip. 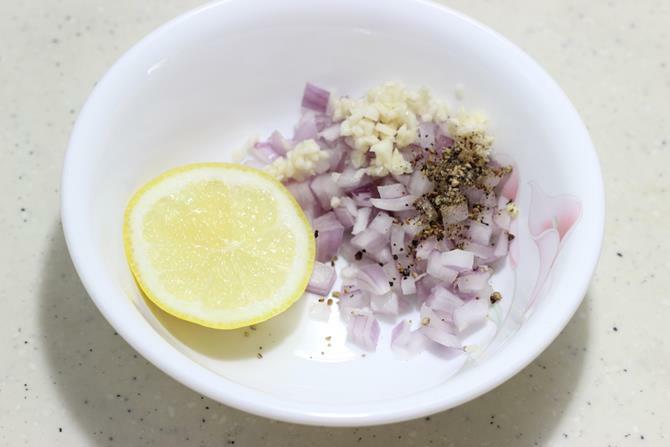 Toss onions, garlic and pepper bowl with little lemon juice. Set this aside for 10 to 30 mins. 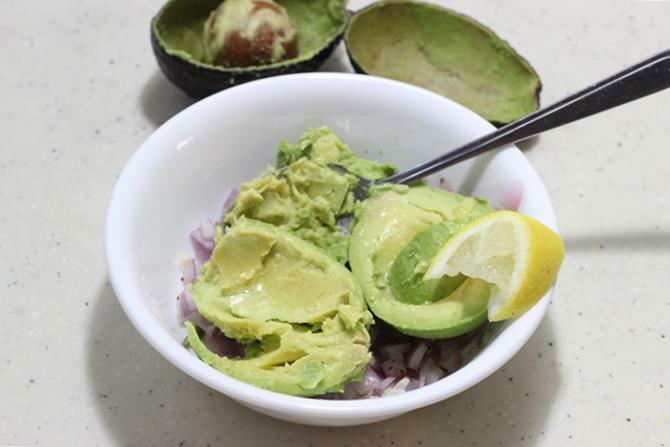 Halve the avocado and scoop off the flesh to the bowl and gently mash it to keep it chunky. Add little more lemon juice. Mix tomatoes, chili, cilantro and salt with the mash. Gently mix it and refrigerate for sometime. Serve as a dip with wedges, chips or with toasted bread. To make sandwich butter the bread slices and toast. 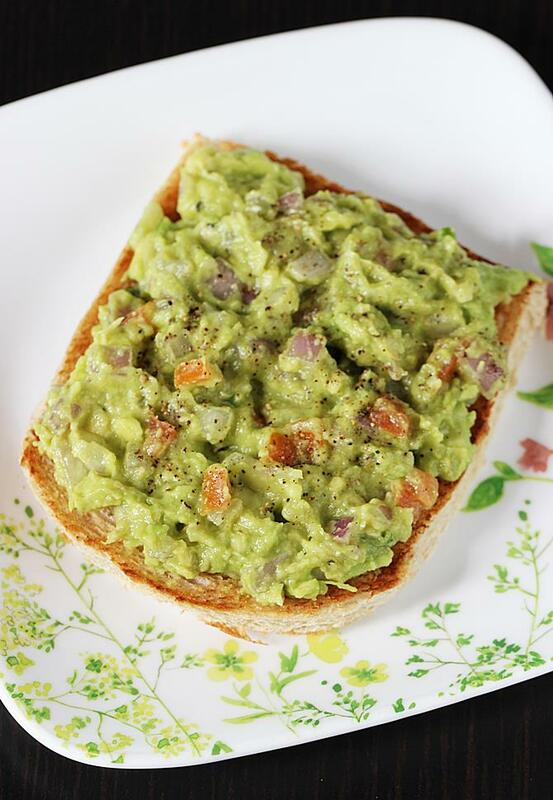 Spread the avocado mash. 1. Add chopped onions, garlic, crushed pepper to a bowl. Add lemon juice. Toss and Set this aside. Lemon juice helps to remove the pungency from the onions and garlic. This is optional but i prefer to do this. 2. 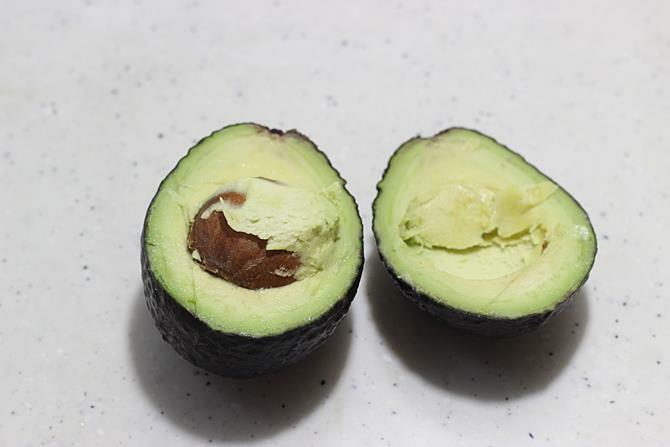 Use a knife and make a deep incision around the avocado lengthwise. The incision should reach the seed. Separate the halves. Remove the seed. 3. Scoop off the fruit to the onions. Add little more lemon juice, this helps to prevent the dip from getting discolored. 4. Mash gently to keep it chunky. 5. Add chopped and deseeded tomatoes, cilantro, salt and chilli. Mix well. You can refrigerate for a while for the flavors to blend well. Butter the bread and toast it. Spread guacamole. Place another slice of bread. 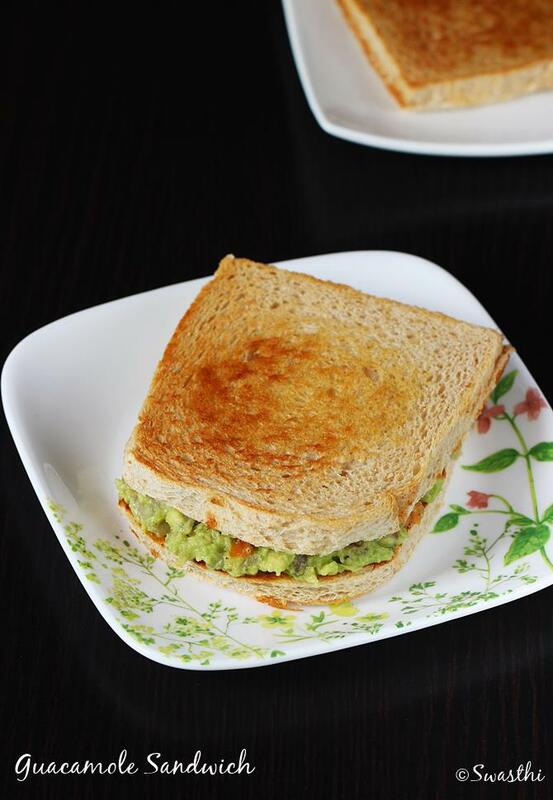 guacamole sandwich is ready. Absolutely delicious sandwich… drool worthy ! Its a delicious looking very nutritious and very creative sandwich. As usual the clicks are gorgeous. Your dish makes me want to make my batch right away. Yummy.